So you got excited and installed Office Professional Plus 2010 or Visio 2010 using your Technet or MSDN subscription and product key? What if you want to change it later? If you got your keys before 1st May they might not allow you to use all the features of the product as it seems there was some mix up with product keys for Terminal Services rather than full product ones. There’s more info about what you might be missing in Office or Visio in this Microsoft support article and longwinded instructions about how to fix the issue and use a different product key. Via control panel, go to install / remove a program (this called different things in different versions of Windows, but if you have a Technet or MSDN subscription I would pretty much hope you know where this is). 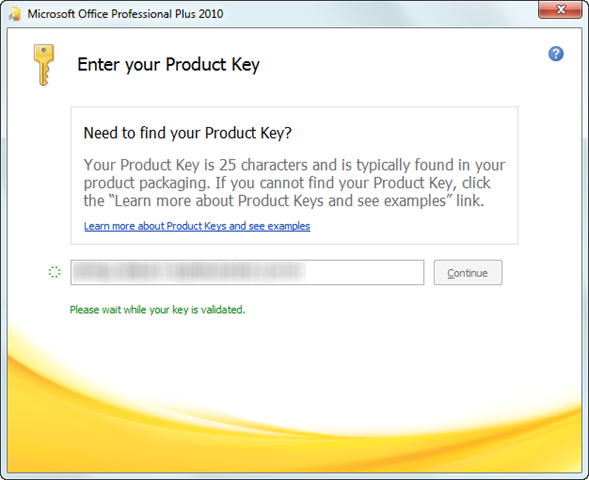 Note when you enter your 25 digit product key, you don’t have to worry about CAPS or putting the hyphens in, that gets taken care of for you (just as with previous versions of Office). Also notice that when you put the last character in you get a message saying “Please wait while your key is validated” and the “Continue” button is greyed out and inactive (as seen below). Assuming your key is valid the message disappears and the button is activated so you can carry on. This is much clearer than the previous method for Office 2007 where the last character simply did not appear on screen while it was validating, there was just a mysterious wait and then the character appeared along with a green tick (or not, if it was invalid). During a normal installation you then go through the various options, but if you are just changing the key that’s all you need to do. Incidentally when you do install Office 2010 if you need to keep your previous version (and have a valid licence to do so, ie your Office 2010 is not an upgrade licence which effectively replaces your previous copy). The files to look for in here are OSPP.HTM (found easily using windows search, especially on Vista or Windows 7 straight from the Start menu) and OSPP.VBS (as far as I know that stands for Office Software Protection Platform). Note: <Product_Key> represents the product key that you want to install. Another useful switch you can use is /dstatus which will report which edition is currently installed and licensed and the last 5 characters of the product key. This can be useful if you are having activation problems and need to make sure you have not used the same key twice on different machines in error, or if you are trying to maintain records and have your huge list of licence codes from various purchases and want to know which ones are used where (and perhaps which are not yet used at all). Of course, for large businesses you should be looking at volume licensing and simplifying this a lot, but many medium sized businesses may not be in a position to do that, yet need to control their spending and show they have good records of their software in use. Why else would I need to change a key? Maybe you installed Office 2010 on more than one computer and then realised you had accidentally put the same key into more than one machine (which would prevent activation from working properly), and you now need to put the right code in. Of course, you might also need to change the product key to stay properly within the terms of the Technet licence since that only allows you to evaluate the product, not use it long term to actually run your business. You can either buy a regular licence to get a code, or if you bought and installed Office 2007 between March 5th and September 30th 2010 you can go to the Office Technology Guarantee site and get a product key for an equivalent version of Office 2010. Note you can only get a free upgrade for 25 Office products which should only matter at all to small businesses not already buying into volume licensing with software assurance, and even then it’s still something for nothing. What about upgrading from different editions of the suites? 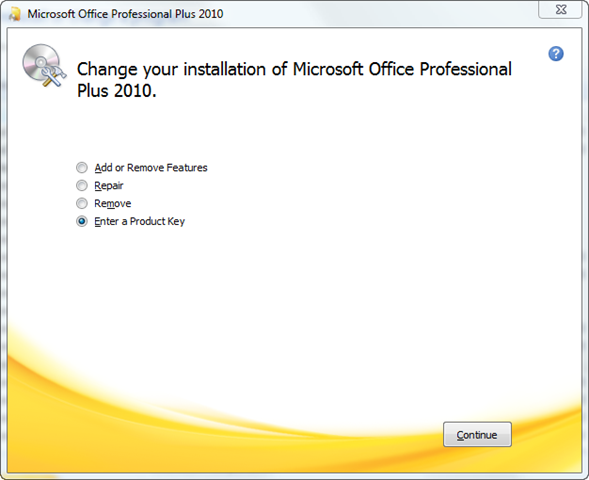 What happens if my Office 2010 upgrade does not include some of the programs in my Office 2007 suite? Office 2010 will not uninstall these programs. If your Office 2007 suite includes these programs and you want to continue using them after you upgrade to Office 2010, do not uninstall them before you install Office 2010. Customers who have an Office 2007 suite that includes Outlook with Business Contact Manager will be able to download Business Contact Manager 2010 separately at no additional cost.